They are beautiful and sometimes otherworldly. Existing beneath the surface of the planet, caves have attracted humans for hundreds of thousands of years. 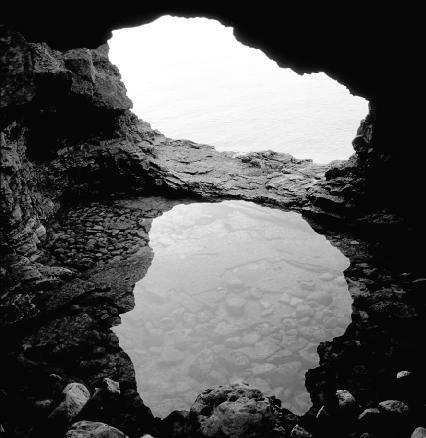 Considered by some cultures as sacred, caves have been used in rituals and ceremonies. They have served both as shelter and burial tombs. The human remains and artifacts found in them have aided archaeologists in learning about early humans. Pictographs (rock paintings) in caves, some estimated to be more than 30,000 years old, attest to the creativity of early humans and their relationship to the natural world. The scientific study of caves is called speleology (pronounced speelee-AH-luh-jee; from the Greek words spelaion, meaning "cave," and logos, meaning "study of"). A cave is generally defined as a naturally formed cavity or hollow beneath the surface of Earth that is beyond the zone of light and is large enough to be entered by humans. Some sources use the word cavern interchangeably with cave. Technically, a cavern is a large chamber within a cave. A series of caves connected by passages is a cave system. Individual caverns and cave systems may be immense. In the Chiquibul (pronounced chee-ke-BOOL) Cave System in Belize and Guatemala, the Belize Chamber measures nearly 1,600 feet (490 meters) long by 600 feet (180 meters) wide. It is the largest cavern in the Western Hemisphere. The largest recorded cave system in the world is Mammoth Cave System. It extends for more than 345 miles (555 kilometers) in south-central Kentucky. There are different types of caves, formed in different areas by different geologic processes, that do not meet the general definition of a cave. Glacier caves are formed inside glaciers by meltwater (water from melted ice or snow) that runs through cracks in the ice, producing tunnels and cavities. Sea caves are formed in cliffs and ledges along the shores of oceans and other large bodies of water where the constant pounding of waves wears away rock. Lava tube caves are formed when the outer surface of a lava flow begins to cool and harden while lava inside remains hot. Once the stream of molten lava inside drains out, a tube or tunnel remains. Kazumura Cave in Hawaii, measuring approximately 38 miles (61 kilometers) in length, is the longest lava tube cave in the world. The most common, largest, and most spectacular caves, however, are solution caves. These caves are formed through the chemical interaction of air, water, soil, and rock. They usually form in areas where the dominant rock is limestone, a type of sedimentary rock (rock formed by the accumulation and compression of sediment, which may consist of rock fragments, remains of microscopic organisms, and minerals). Many solution caves feature streams and lakes and unusual mineral formations. These formations are known as speleothems (pronounced SPEE-lee-ohthems; from the Greek words spelaion, meaning "cave," and thema, meaning "deposit"). Because of the way they form, speleothems are also commonly known as dripstone. 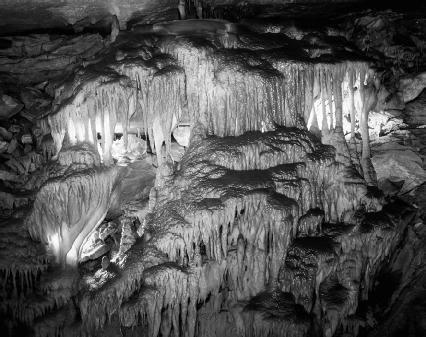 The primary speleothems are stalactites, stalagmites, columns, curtains, and flowstones. A stalactite (pronounced sta-LACK-tite) is an icicle-shaped formation that hangs from the ceiling of a cave. A similarly shaped deposit, though often not as pointy, that projects upward from the floor of a cave is a stalagmite (pronounced sta-LAG-mite). Stalagmites generally form underneath stalactites. The two deposits often grow until they join, forming a stout, singular deposit known as a column. A curtain (sometimes called drapery) is a mineral deposit that forms a thin, wavy or folded sheet that hangs from the ceiling of a cave. Any mineral deposit that forms sheets on a wall or floor of a cave is known by the general term flowstone. Although normally whitish or off-white in color, speleothems may contain traces of different minerals that add shades of brown, orange, yellow, red, pink, green, black, and other colors. Cave ceilings often collapse. As they do, the rock or ground above them also collapses. If the cave is located near Earth's surface, a bowl-like depression known as a sinkhole can develop on the surface. Sinkholes may also form above areas where limestone or other sedimentary rock has been eroded away (erosion is the gradual wearing away of Earth surfaces through the action of wind and water). Sinkholes may range in diameter from a few feet to a few thousand feet. A landscape dominated by sinkholes on the surface and extensive cave systems underneath is known as karst topography or karst terrain. Karst ( Kras in Serbo-Croatian) is the name of a limestone plateau in the Dinaric Alps in northwest Slovenia that is marked by such geological formations. It was the first area to be studied based on these formations. Karst topography also features losing streams, which are streams on Earth's surface that are diverted underground through sinkholes or caves, and springs, which are areas where water from underground flows out almost continuously through an opening at Earth's surface. As karst topography continues to develop, a variety of landforms may arise on the surface. This is especially true in tropical or humid climate areas. Caves that grow ever larger soon start to collapse. Sinkholes in the area enlarge and merge. Sections of the ground remain elevated as streams and other running water erode the limestone rock mass around them ever deeper. These sections may form hills, known as cone karst, separated by the sinkholes. Eventually, steep limestone landforms called karst towers may remain standing hundreds of feet above the surrounding landscape. With nearly vertical walls, the towers are often bare of vegetation. 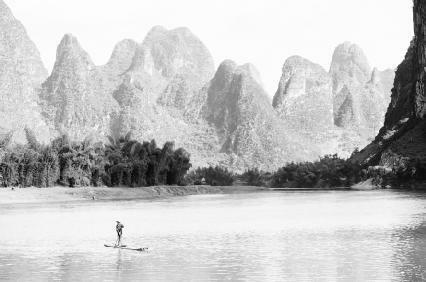 The world's most impressive karst towers are perhaps those found in the Guangxi (pronounced GWAN-shee) Province in southern China. A naturally formed cavity or hollow beneath the surface of Earth that is beyond the zone of light and is large enough to be entered by humans. A large chamber within a cave. A series of caves connected by passages. A thin, wavy or folded sheetlike mineral deposit that hangs from the ceiling of a cave. The general term for a sheetlike mineral deposit on a wall or floor of a cave. Freshwater lying within the uppermost parts of Earth's crust, filling the pore spaces in soil and fractured rock. A landscape characterized by the presence of sinkholes, caves, springs, and losing streams. A sedimentary rock composed primarily of the mineral calcite (calcium carbonate). A stream on Earth's surface that is diverted underground through a sinkhole or a cave. Rock formed by the accumulation and compression of sediment, which may consist of rock fragments, remains of microscopic organisms, and minerals. A bowl-like depression that develops on Earth's surface above a cave ceiling that has collapsed or on an area where the underlying sedimentary rock has been eroded away. A mineral deposit formed in a cave. An icicle-shaped mineral deposit hanging from the roof of a cave. A cone-shaped mineral deposit projecting upward from the floor of a cave. Caves are found almost everywhere around the planet. More than 17,000 have been identified in the United States, underlying 20 percent of the country's land surface. They are found in 48 of the 50 states (only Louisiana and Rhode Island lack caves). While the processes that form lava tube caves, glacier caves, sea caves, and other caves are obvious, those that form solution caves—the most common caves of all—are not. Solution caves are not formed by volcanic activity or by the abrasive forces of water or wind. The primary force behind their formation is chemical weathering, which alters the internal structure of minerals by removing or adding elements. The formation of a solution cave begins in Earth's atmosphere. As precipitation (mainly rain) falls to the planet's surface, the water (H 2 O) reacts with carbon dioxide (CO 2 ) in the atmosphere to form weak carbonic acid (H 2 CO 3 ). This is the same acid found in soda pop that produces its "fizz." Once this water and carbonic acid solution reaches Earth's surface and begins to percolate down through the soil, it reacts with carbon dioxide given off by decaying plants and animal matter to form even more carbonic acid solution. The main mineral in limestone is calcite (calcium carbonate). Most seashells are made of this mineral. Limestone is almost insoluble (unable to be dissolved) in water. Carbonic acid, however, dissolves calcite from limestone. Over hundreds of thousands to millions of years, as carbonic acid moves downward through cracks and fractures in limestone, it dissolves the rock and forms crevices. Over time, these crevices widen to become passages and caverns. The entire state of Florida lies on limestone. Much of this underlying rock is weathered, featuring cavities exceeding 100 feet (30 meters) in height and width. Although many are buried beneath sediments, sinkholes dot the land surface. This is especially true in central Florida, an area prone to sinkhole formation. The water table in this area is often only 5 to 10 feet (1.5 to 3 meters) below the surface of the ground. The largest sinkhole to have formed in Florida in recorded history appeared suddenly in May 1981 in the city of Winter Park. In the span of one day, a hole measuring 350 feet (107 meters) wide and 110 feet (34 meters) deep opened up. The Winter Park sinkhole, as it became known afterward, swallowed a house, five cars from a nearby parking lot, and part of a city swimming pool. The city later stabilized and sealed the sinkhole, converting it into an urban lake. and fractures in rocks. As rain or melted snow seeps through the ground, some of it clings to particles of soil or to roots of plants. The remaining water moves deeper, drawn downward by gravity, until it reaches a layer of rock or sediment, such as clay, through which it cannot easily pass. It then fills the empty spaces and cracks above that layer. This water is known as groundwater, and the area where it fills all the spaces and pores underground is the zone of saturation. The top surface of this zone is called the water table. Above it, the pores and spaces in rock hold mainly air, along with some water. This is called the zone of aeration. Caves initially form just below the water table. Filled with water, the cavities and fractures in the limestone are enlarged by the continuous movement of water and carbonic acid through them. Air enters a cave only when the water table is lowered through some geologic event, such as erosion of the land surface above or uplift of the rock beneath the cave. When this occurs, the cave stops enlarging and water begins to drain out of the cave down through cracks and other passages in the surrounding limestone. Areas of the cave may continue to lie below the water table and, therefore, are still water-filled. An underground stream, whose water source lies farther away, may still flow through the cave. The air-filled sections of the cave provide the perfect environment for the development of speleothems. Even though the water table may have dropped, water weaving its way downward from Earth's surface still enters a cave through cracks and crevices in its ceiling and walls. When this water and carbonic acid solution enters the cave, some of the carbon dioxide in the solution escapes into the air (much like a soda pop that loses carbon dioxide and goes "flat" when left uncovered). This changes the chemical structure of the solution, and it can no longer hold the dissolved calcite. The calcite is then deposited in crystallized form as a speleothem. Its shape depends on where and how quickly water enters the cave. Though growth rates of speleothems vary from cave to cave, it may take 120 years or longer for 1 cubic inch (16.4 cubic centimeters) of calcite to be deposited on a cave formation. The largest cavern in the world is the Sarawak Chamber of the Good Luck Cave in Sarawak, Malaysia. It measures approximately 1,970 feet (600 meters) in length, 1,310 feet (400 meters) in width, and 330 feet (100 meters) in height. It has a total area of 1,751,300 square feet (162,700 square meters). The cavern is large enough to hold eight Boeing 747 aircraft lined up nose to tail. By comparison, the largest cavern in the United States is the Big Room in the Carlsbad Caverns cave system in New Mexico. Covering an area of 357,472 square feet (33,210 square meters), it is just over one-fifth the size of the Sarawak Chamber. Water slowly dripping from a small opening in the ceiling of the cave initially forms a soda straw. This tubelike formation develops when each drop evaporates, leaving behind a small amount of calcite around its border. As more drops fall, more calcite is deposited and the tube grows downward. Even though they are quite fragile and have the diameter of a drop of water, soda straws may grow to 3 feet (1 meter) or more in length. If the tube becomes blocked and more drops begin to fall, then a stalactite forms around the soda straw. If drops of water increase even further from the ceiling, they may fall off a stalactite before evaporating and form a stalagmite. Because the drops spread when they hit the floor or ledge of a cave, a stalagmite is often wider than the stalactite under which it often grows. An extremely rapid drip from a ceiling may form a pool of water on the floor of a cave. As the water evaporates along the edges of the pool, calcite may form terraces. If water drips from various points in a crack in a cave ceiling, stalactites may grow in a row. Eventually, they may grow together, forming a continuous sheet. A flowing sheet may also develop if water seeps slowly along the length of a thin slit in the ceiling. When a crack appears in a cave wall, a film of the water may flow down the wall and over ledges, forming sheets of flowstone. The multitude of speleothems that develop in caves vary widely. In fact, no two caves are ever alike. The air temperature of the cave, the amount and chemical composition of the water entering it, and the size of the joints and cracks in its ceiling and walls are just a few of the factors that determine a cave's particular appearance. Caves are environments that contain not only fantastic mineral formations but rare and unusual animals. These include blind fish, colorless spiders, and many other troglobites (pronounced TROG-lah-bites), animals that live in caves and cannot survive outside of them. Troglobites have evolved over millions of years, becoming adapted to the absolute blackness and meager food offerings of cave life. Caves are also home to animals that venture out periodically in search of food. Beetles, crickets, frogs, salamanders, and others are of this type. Finally, caves serve as temporary homes to animals that move freely in and out of them. Bats, bears, moths, and skunks are examples of these. For many people, cave exploration is a fascinating and fun activity. Spelunking (pronounced spi-LUNG-king) is the term given to such exploration. Spelunking societies, organizations, and groups exist across the country, helping people explore the more than 100 caves that are open to the public for study and enjoyment. Although caves are carved out of rock, they are fragile. Vandalism, property development, and air and water pollution have all had a devastating effect on caves and cave life. Even oil left on a speleothem by the accidental touch of a human hand can alter its formation, eventually destroying it. Of the more than 130 species that inhabit the Mammoth Cave System in Kentucky, dozens are considered threatened or endangered. For the continued study and exploration of caves and the life they harbor, great care must be taken. Most caves are constantly changing. Some are still enlarging, with new passages being formed below the water table (in a cave system, the oldest caves and passages are closest to Earth's surface). Many caves are still wet, with calcite being deposited on various formations. Other caves and cave systems, however, are dry and are no longer enlarging or growing speleothems. Eventually, in a dry cave, the thin ceiling may lose support and collapse, exposing the cave to the surface through a sinkhole. The deepest limestone cave in the United States is Lechuguilla (pronounced lech-uh-GEE-yah) Cave. Part of the Carlsbad Caverns cave system in southeast New Mexico, it extends to a depth of 1,571 feet (479 meters). The cave was discovered by a group of cavers in 1986. Scientists estimate that the cave has existed beneath Earth's surface for at least 2 million years. The cave is notable not only for its size, but for its fantastic array of rare speleothems. Unlike other solution caves, Lechuguilla was not formed by carbonic acid. Rather, rising hydrogen sulfide from nearby oil fields reacted with groundwater to form sulfuric acid. This acid dissolved the limestone and created a cave filled with lemon-yellow sulfur formations. Among those is a 24-foot (7.3-meter) soda straw, the longest in the world. In addition to unusual speleothems, Lechuguilla contains rare bacteria that feed on the sulfur, iron, and manganese minerals present in the cave. Scientists believe these bacteria may have played a part in the formation of the cave and its speleothems. They also believe the sulfur-laden environment of Lechuguilla may be similar to that on the surface of Mars, so they have studied the cave's bacteria to determine how life may exist on that planet. The Mammoth Cave System, properly known as the Mammoth Cave-Flint Ridge System, is the largest cave system in the world. Lying beneath the surface in south-central Kentucky, the system extends for more than 345 miles (555 kilometers) and to a depth of 379 feet (116 meters). Geologists believe there may be an additional 600 miles (965 kilometers) of undiscovered passageways connected to the system. Scientists estimate the system began to form in the limestone rocks underlying the area some 30 million years ago. Archaeologists have found evidence that early Native Americans inhabited the cave system as many as 4,000 years ago. is a cavity in the system that measures 192 feet (59 meters) in height. Another extraordinary feature is Frozen Niagara, a mass of flowstone 75 feet (23 meters) tall and 4 feet (1.2 meters) wide. On January 6, 2001, a team of Ukrainian and Russian cavers exploring a cave in the Abkhazia region of the Republic of Georgia reached a depth of 5,610 feet (1,710 meters). This event confirmed Voronya Cave (also known as Krubera Cave) as the world's deepest cave. The previous record holder had been Lamprechtsofen-Vogelshacht Cave in Austria, which measures 5,355 feet (1,632 meters) in depth. Voronya Cave was so-named because of the large number of crows that gather around its entrance ( voron is Russian for "crow"). Discovered in the late 1960s, the cave is located in a valley in the western Caucasus Mountains. Meandering downward through dense limestone, the cave features one entrance that leads to three branches. When first explored in the 1980s, the cave was thought to end in a narrow passage 1,110 feet (3,335 meters) beneath the surface. In 1999, an expedition found new passages that led to deeper pits. Aulenbach, Nancy Holler, and Hazel A. Barton. Exploring Caves: Journeys into the Earth. Washington, D.C.: National Geographic, 2001. Gillieson, David S. Caves: Processes, Development, and Management. Cambridge, MA: Blackwell Publishers, 1996. Moore, George W., and Nicholas Sullivan. Speleology: Caves and the Cave Environment. Third ed. St. Louis, MO: Cave Books, 1997. Palmer, Arthur N., and Kathleen H. Lavoie. Introduction to Speleology. St. Louis, MO: Cave Books, 1999. Taylor, Michael Ray. Caves: Exploring Hidden Realms. Washington, D.C.: National Geographic, 2001. "Cave Facts." American Cave Conservation Association. http://www.cavern.org/CAVE/ACCA_index.htm (accessed on August 14, 2003). "Caves Theme Page." Gander Academy. http://www.stemnet.nf.ca/CITE/cave.htm (accessed on August 14, 2003). "Karst Topography Teacher's Guide and Paper Model." U.S. Geological Survey. http://wrgis.wr.usgs.gov/docs/parks/cave/karst.html (accessed on August 14, 2003). "NOVA: Mysterious Life of Caves." WGBH Educational Foundation. http://www.pbs.org/wgbh/nova/caves/ (accessed on August 14, 2003). "Park Geology Tour of Cave and Karst Parks." National Park Service, Geologic Resources Division. http://www.aqd.nps.gov/grd/tour/caves.htm (accessed on August 14, 2003). Can you explain what "box work" is when found in caves and how it is formed? I've been told it is from mudflats drying and then the calcite drips into the cracks to build up over time. It is then solidified by heat. Have you ever seen boxwork before? If so where? I would like to compare it to a formation near my home in Springville, AL.